Thybar is the leader in adapting new rooftop units to existing roof curbs with Retro-Mate. Retro-Mate saves costly curb reconstruction by mechanically interfacing the new unit and existing curb. Thybar Corporation teams up with other manufacturers to supply the HVAC industry with the latest solutions and technology. Often times, manufacturing limitations can restrict the development of new products getting to market. Thybar can help. We will bring your equipment in house for modification and for factory installed components. Thybar has an ETL listing on most modifications to preserve your unit label. Severe wind loads or seismic activity occurs in many areas in the U.S. Thybar seismic curbs for rooftop HVAC's are specifically designed to withstand these forces. Compliance verification and calculations are performed by a Licensed Professional Engineer (P.E.). This includes all 50 states. Founded in 1959, and with 5 factories across the country, Thybar is the oldest and largest roof curb manufacturer in the world. We’ve built more curbs than anybody, relying on years of experience and libraries filled with HVAC equipment data. No matter what type of roof system you have or how big the equipment is, we have the roof curb design that works for you. 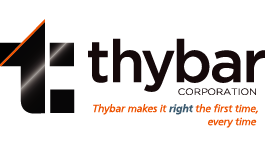 When our customers need a solution, they know to “Think Thybar”. We work step by step with you to understand the physical characteristics of the building and the jobsite demands. If needed, we do field measurements, for your peace of mind. From the conception of a project, through the installation of your equipment, we are on hand to help your project run smoothly. 3D modeling software and HVAC application knowledge help us get an exact fit and the right application.